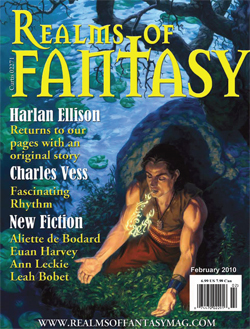 Realms of Fantasy magazine has a revamped Web site up and at those new and improved digs is also offering folks a free pdf version of its February issue, as a way of getting you to try it, perchance to get a subscription or suchlike. I’ll note (because it’s all about me me me) that this is the issue that features Paul Witcover’s review of The God Engines in it (reminder: some spoilers), but I think more relevantly for the rest of you it features new fiction by Leah Bobet, Aliette de Bodard, Euan Harvey, Ann Leckie, and some scrappy kid named Harlan Ellison. Yeah, I know. Never heard of him before either. In any event, check out the site and the issue, and if you’ve never tried RoF before, give it a read and see what you think. As I’m being asked for the link in e-mail yet again — hey, there’s a search function right there in the sidebar, man — here’s a link to The 10 Least Successful Holiday Specials of All Time. Enjoy. Again.